Once again the Knob Creek private selection came through for me. I've gone on and on in this blog about these store picks being one of the best values out there. 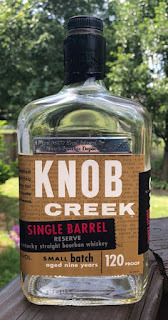 You get a privately selected, single barrel bourbon, usually aged 9-11 years, and sometimes as long as 13 1/2 years such as this one, or even longer, at nearly barrel strength, and for a cool $40.00. You can't go wrong in picking one of these up off the shelf, and this bottle proved to be no exception. The nose was all brown sugar and caramel. It came across immediately as a sugar bomb, almost like those caramel lollipops, Sugar Daddies. It also had milk chocolate and even a slight peanut note to the nose at first. This developed some additional stone fruit notes later on, with almost a tart cherry pie quality to the nose. Certainly the way it smelled suggested the flavor was, at the least, going to be complex. Not surprisingly, the brown sugar and caramel from the nose was spot on, and the first sip was like drinking a boozed up version of a Sugar Daddy. Given the age, I expected a bit of dryness on the back end, perhaps even to balance out that sweetness, but such wasn't the case. It has surprisingly little wood influence to it, only barely noticeable on the back end. Initial pours had a light burn to them, but that is to be expected given the proof, and it was anything but offensive. In fact, it cut the sweetness a bit. Eventually that burn faded, however, and in doing so improved this bourbon so much! While I thought the burn provided a nice balance, what I found was it was masking the rich, sweet flavors that were waiting to emerge in this bourbon. At first I thought the alcohol burn provided a nice balance to the sweetness. However, as the alcohol seemed to fade, the sweetness came forward in a big way, but not in a way that made it cloyingly sweet or anything. Rather, that caramel/brown sugar thing it had going developed more in richness than intensity, if that makes sense. Don't get me wrong, towards the end of this bottle this absolutely took on a dessert-like quality. However, it wasn't overly sweet, just richly sweet. I may be talking in circles here, but it's as though with each successive pour, the quality of the caramel improved, like it started with some generic, store-brand caramel and finished with high-end, melt-in-your-mouth-and-consume-your-world high end caramel from Godiva or whoever might make really awesome caramel. This bourbon changed much more from first pour to last than anything else I've had in the past year or so. At first it was a very good bourbon. The last pour was an absolutely amazing bourbon that made me wish I had a few bottles more.